The Cumberland & Dumfriesshire Farmers Mart P.L.C. had forward 46 prime cattle, 28 over thirty month cattle, 4,568 prime lambs and 4,768 cast ewes & rams at their weekly sale at Longtown on Thursday 25th November, 2010. A plain show of prime cattle were forward and saw trade similar on the week. Limousin bullocks to 174.5p from RM & P Armstrong, Slealands and purchased by W Kirkup & Sons, Butchers, Longtown, 171.5p, 165.5p Dashwellgreen. Charolais 164.5p, 163.5p Sceughdyke. Top price per head £1196 for Limousin from Dashwellgreen; Charolais 1167.95 Sceughdyke. Heifers sold to 170.5p for Limousin from M/s Blaylock, Hallburn and purchased by JA Jewitt Ltd, Wholesalers. Others to 169.5p Brydekirk Mains, 167.5p, 158.5p Hallburn. Charolais 163.5p Brydekirk Mains, 155.5p Sceughdyke, 153.5p Hallburn, 153.5p Sceughdyke; British Blue 164.5p Houghton House. Top price per head £936.35 for Charolais from Hallburn; Limousin £912.88 Hallburn. A poorer show of OTM cattle saw plainer feeding type cows good to sell again. Top price was 122.5p for a Limousin heifer from JW Coulthard & Son, Brisco Hill. Limousin cows 99.5p, 97.5p Englishtown, 87.5p Greystoke Castle; British Blue 93.5p Smallholms. Another grand show of lambs were forward to a full ring of buyers. Trade was the best seen this week with an overall average of 168p in the SQQ (25-45kg) and 164.7p with all classes in. 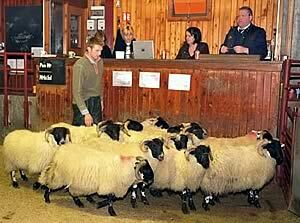 The sale topped at £99.80 for a Beltex from S Frizell, Thorneylands, which were also top price per kilo at 256p. Heavy lambs 45kg + were £5 up on the week. Beltex £99.80 Thorneylands, £90.50 Mouldy Hills, £86.50 Nunscleugh; LLynn £73.20 Hazelbank; Swaledale £63.20 Burnhouse, £62.80 Kilnstown; North Country Cheviot £77.80 Whiteknowe, £73.80 Pilmuir & Whiteknowe; Suffolk x £97.50 Boreland, £93.50 Guards Mill, £87.50 Cardew Hall; Cheviot £74.20 Hallburn, £73.50 Pilmuir, £73.20 Hallburn; Texel £93.50 Gallowberry, £90 Crookholm, £89.50 Cardew Hall, £89.20 Brydekirk Mains; Charollais £86.50 Cardew Hall, £84.20, £82.80 Leaona Villa: Greyface £87.50 Newton Cottage, £78.80 Slealands, £78.50 Wanwood Hill; Cheviot Mule £73.20 Archerbeck; Leicester £73.50 Nunscleugh, £70.20 Plumpe; Blackface £71.50 Easthouse, £69.80 Boreland, £65.20 Minsca. Light lambs to £66.80 for Texels from Burmoor, £65.50 Chipphead; Suffolks £60.80 Crawfordjohnmill, £53.80 Tone Hall; Cheviot £60.80 Woodside, £58.80 Leahaugh, £56.50 Newington; Greyface £58.80 Fallowfield, £57.80 Newington, £56.50 Wallend; Cheviot Mule £58.20 Dinley; Blackface £59.80 Westhills, £57.20 Caberston; Leicester £66.50 Newton Cottage. A grand show of cast ewes and rams were forward to the usual buyers with large heavy ewes easier on the week with larger leaner ewes upholding recent rates. Best fleshed Blackface and Cheviot ewes were £2-£4 dearer on the week and the sale topped at £130.50 for Texel ram from Pirntaton, £123.50 Holm Farm; Suffolk £88.50 Tone Hall & Tirril House; Cheviot £70.50 Dalton Head; Charollais £100.50 Whingate; Leicester £84.50 Whingate; Blackface £68.50 Thornton Tower, £58.50 Eastgate; North Country Cheviot £82.50 Birneyknowe, £68.50 Holm Farm; Swaledale £64.50 Cowburn; Beltex £118.50 Willimoteswick; Llynn £88.50 Burmoor. Heavy ewes to £114.50 for Texels from Pirntaton, £108.50 Snowgreen, £107.50 Tirril Side; Suffolk £110.50 Tirril Side, £104.50 Eastgate & Stackbraes, £100.50 Townfoot; Charollais £88.50 Eastgate; Halfbred £90.50 Guards Mill; Greyface £96.50 Maryhouse, £83.50 Wallgate, £74.50 Chipping Side; Cheviot Mule £89.50 Colmslie Hill, £88.50 Clackmae; Leicester £92.50 Wanwood Hill, £90.50 Stackbraes; North Country Cheviot £96.50, £94.50 Wickside, £88.50 High Moat, £86.50 Eastgate; Beltex £84.50 Snowgreen; Llynn £67.50 The Height; Zwartbles £84.50 Colmslie Hill, £74.50 Netherfoot. Light ewes to £71.50 for Blackfaces from Thornton Tower, £68.50 Horseholm, £67.50 Wanwood Hill; Cheviot £67.50 Dinley, £59.50 Lintgate, £57.50 Winterhope; Swaledale £67.50 Burnhouse, £56.50 The Ash; Jacob £58.50 Colmslie Hill; Lonk £64.50 Chippingside.